This week I managed to get a few things started and ordered some bits for a few small projects I'm working on. 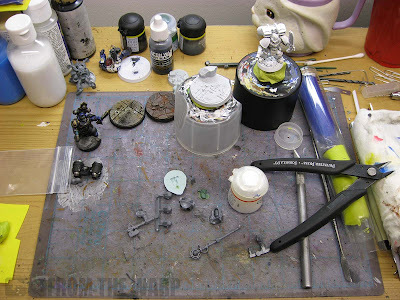 They're not new projects, one is another repair of a model for a friend similar to the Raven Guard squad I did a few weeks ago. In this case, he wants the model altered so it looks more like a Librarian and not a Chaplain. Easy enough to do. I've also tossed in a couple more pics from my desk to show you what I'm working on. I dug through all my bases since I'm trying to nail down the color scheme for my Novamarines force. I like the black and red one on the right, I just need to refine it a bit more. I'll have a pic of my first test model on Monday too for everyone to critique. Here are the bits I'm using for that Librarian conversion I mentioned. He's actually part of the Flesh Tearer squad I did a while ago and posted about yesterday as well. I don't order a ton of bits, but it always seems like I need to ones that are never in stock. And the one piece I seem to cast more of than anything else. The holstered bolt pistol. 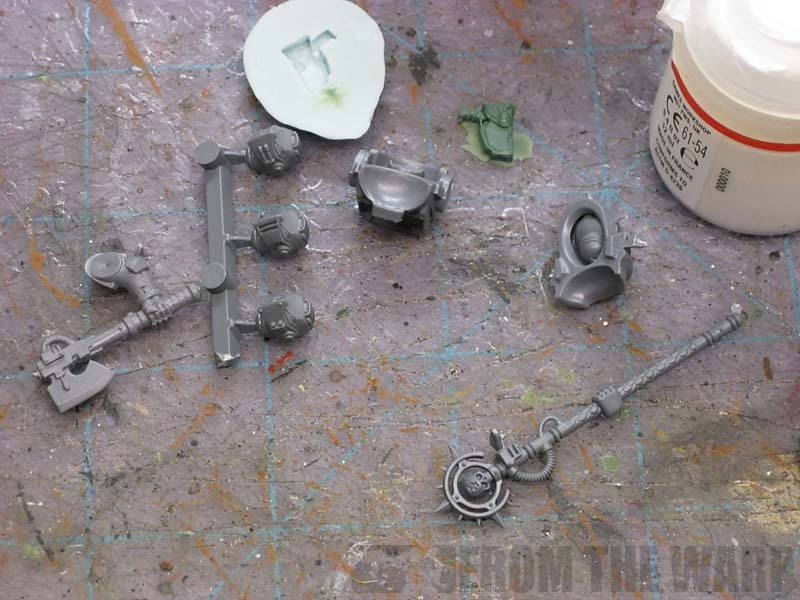 Easy to cast, looks great on any model and adds that extra detail. You can see my Paladin heads there too. I'm not starting Grey Knights, they are for my Novamarine termies if I can get them to fit inside the standard head opening. 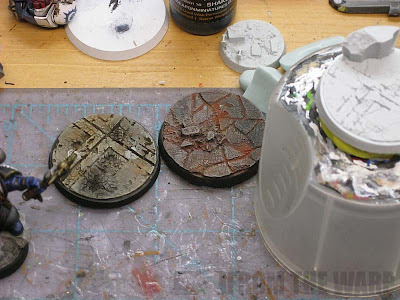 are those bases custom made or did you order them from somewhere? they look quite awesome! Peter: They are two of my favorites from Secret Weapon minis. I'm using them as tests for basing scheme. 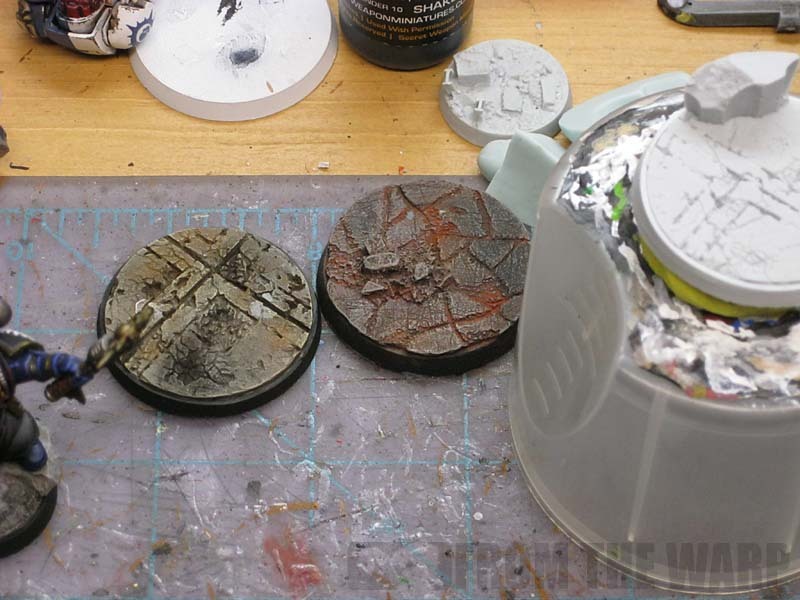 I really like the reddish one, Is that done with weathering powder? Elzo: That's exactly what it is. I'm thinking that's the style I want to go with so I can tie my guys to the basing easily and the bases will be dark enough to make the models pop out from them. I like the actual base for the non red one. The bit not the color. Will: Those are a very cool range (Ruined Temple I believe). They have great detail but are still flat so it's easy to set models onto them. I'm fairly sure I'm going with the red/black colors, but I'm still not sure which base theme to go with. There are so many I like that it's tough to choose one style. Would you have to choose one style as long as the colours were the same? ieuan: I've actually contemplated that... using a mix of base styles that were painted in the same color scheme. Sort of like cherry picking the particular bases I liked most from a variety of lines.